This is known as the rainy season when we are visited by the southern humpback whales who migrate from the Patagonia in South America, to the warm waters of the South Pacific off the coast of Costa Rica. Their mission here is mainly to give birth to their calves, known as ballenatos, and some like it for courtship. The warm waters of the bay offer many benefits for the growth of the young as well as protection against its main predators, orca whales and some sharks. The population in this area of the south is quite large in quantity, making sightings more plentiful during the whale tours. August and September are the peak months for sightings where the probabilities exceed 70%. 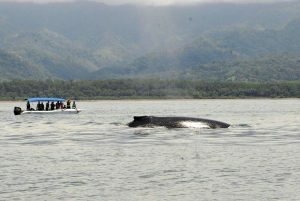 This time is referred to as our dry season and begins with the visit of the humpback whales of the Northern Hemisphere. They begin arriving in late December during a migration from Oregon, with the same purpose of reproduction and courtship. The population of these whales is much smaller, therefore reducing the percentage of sightings compared to the other species. Bahia Ballena was a fishing village in the 70’s, 80’s and part of the 90’s. At the end of the 90’s the fishermen decided to start offering boat rides to beach goers showing them the island and the coastline while observing dolphins and whales. In the beginning of 2000, the Costa Rican government began supporting the locals who were offering those tours by providing the necessary training to do the excursions in a responsible way, training the captains and guides to make the tours more formal. Today, the tourism industry in Costa Rica is very professional, using bilingual guides and captains who are certified by the Costa Rican Chamber of Tourism, as well as being organized as associations. There are about 10 well organized whale watching companies in Bahia Ballena that even offer other activities. Whales and dolphins, like other living beings, are susceptible to the impact of man on their environment. The application of friendly practices in the operation of tours is of great importance for their protection. Currently, Bahia Aventuras has a protocol for sightings, making the least possible impact on the cetaceans. This protocol includes maintaining a suitable distance from the dolphins, while navigating at the same speed and in the same direction as them. In Costa Rica, swimming is not allowed near the cetaceans as not to intervene in their habitat or their behavior. The use of experienced captains and guides is extremely important. They must know whether or not the whales or dolphins feel threatened in the presence of boats by observing and evaluating their behavior. It is up to the captain to determine if the sightings should be continued or abandoned, by respecting the space of these beings. When you choose any of our tours, you will be safe and well informed!